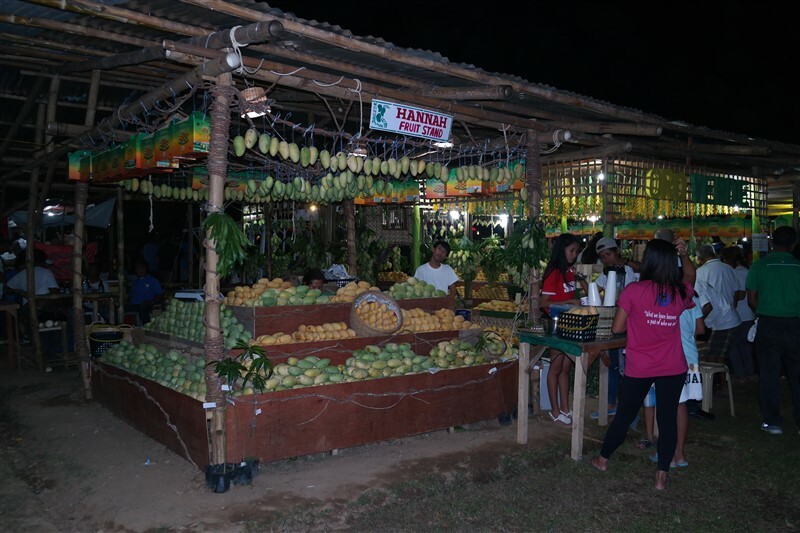 Manggahan Festival, a festival that celebrates… mangoes! We had been in the Philippines one week already when I realized that Mango festival Guimaras was about to take place 3 islands… ahead of us in less than a month! 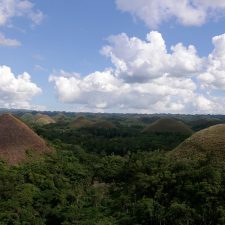 We were in Bohol at that time and I started researching more about things to do in Guimaras island and how to get there with not much of a success; the place seemed to be unpopular among the (Western) travellers in the Philippines and the only bloggers I could find online had spent there 1-2 days. On the other hand, the literally few accommodation facilities were already fully booked due to the festival! Desperately looking for a place to stay, an itinerary, transport methods and other attractions in Guimaras I ended up booking the one and only available room I could find for a normal price… on facebook(! )- such a terrible mistake! But for the sweetest mangoes of the world (oh yes, Guimaras is well known for that!) I could do anything! This is what we were falling for! 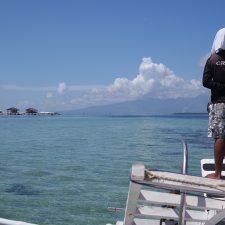 From Bohol, we had already planned to hop on Siquijor island and then Negros Oriental for visiting Dumaguette, Apo island and swim with turtles. To reach Guimaras island from Negros is not that tricky, being able to find this info online though is a different story! You need to take the public bus from Dumaguete to Bacolod and stop at Pulupandan where a small ferry (RORO) will take you to Sibunag, the second port of Guimaras island (you may have to take a tricycle from the Pulupandan bus stop to the port though- always negotiate the price beforehand)! In fact, when we decided to visit Guimaras we realized that the Maldives of the Philippines were on the way to Pulupandan so the original plan changed one more time to include this gorgeous place! Sibunag port is on the other side of the island (the main port of Guimaras is Jordan Wharf, you can read about that at the end of the post) and after our arrival there we could not find any jeepney to take us to the capital, Jordan. Having said that, a tricycle was our only chance and (after a good negotiation as the distance was over 45 minutes) we managed to arrive at the place I had booked- which looked a bit unreal! The “Mountain Biker’s Hub” is owned by an amazing family that offers adventurous mountain Bike tours, a gym and 2-3 basic rooms for guests. Did I mention the phrase “terrible mistake” before? Yes, I did! In this place we got spoiled by the Filipinos’ hospitality and kindness and we had the best time ever! But let s start from scratch! Tommy, the lovely owner, convinced us to take a mountain bike tour with him around the hilly Guimaras. Do I need to explain that we almost died that day as we hadn’t biked for months (and London is considerably flat!) especially under the hot tropical sun? Poor Tommy had to… push us in many uphill roads and then to…throw us (literally!) on jeepneys for the way back! I think we have officially been the worst mountain bikers of his tours for 2018 or even for the entire decade! However, we enjoyed the hidden places, some old small churches, a secret little beach (where I swum with my underwear before my fainting! ), the mangos plantation (SO beautiful!) and some fresh cut coconuts from a Filipino-tribe family in the mountains which is protected by the government! Throughout the tour we stopped multiple times to try fresh exotic fruits and it was the first time ever I ate fresh cashew fruit and drunk its juice, sooo weird and tasty! Such a great experience overall and, as Tommy said, we survived anyway! Afterwards, we got invited to Tommy’s wife birthday party next to the sea where they have built a wooden platform/ kiosk with karaoke facilities! As they knew I am vegetarian they prepared so much Tortang Talong (eggplant omelette – paradise!) and other traditional local dishes that I wished I could eat moooore! Of course, we sung karaoke (we are in Asia after all!) and danced their music and Latin dances too– this warm Filipino company even insisted upon dancing some Greek dances so we put some Greek music too! This actually was one of the best and most emotional night in my 6-month journey in Asia. The moment we heard our hosts and their friends yelling that “You are not as other Europeans who visit our place and seldom talk to us- you are like us” I felt a controversial feeling of happiness and embarrassment. Happiness because it is amazing when locals feel that foreigners can be “good” too and that we all are just.. humans but SO embarrassed and angry about some other travellers’ behaviour towards the locals. Our Guimaras adventure didn’t end there. Tommy convinced us again to follow him on a secret place where you could snorkel and see the coral reef literally 20cm below the sea level! This time we rented his motorbike (!) 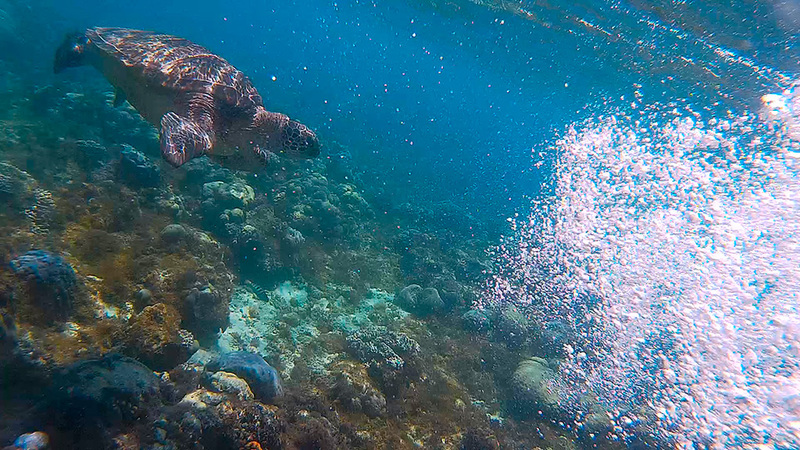 and after half an hour walking from the “parking” we reached a fantastic place where we managed to snorkel for hours and even watched Nemo fishes in their nests – just few meters from the shore, watch our small video below! It was so much shallow so we had to float as horizontally as possible in order not to touch the coral reef at all. This place is a local secret and people are scared of this being ruined by tourists if it becomes famous- since I do not reveal secrets if you ever visit Guimaras you can ask Tommy to guide you! As was anticipated, we kept the rental motorbike for the rest of our stay; the island has many routes worth exploring, including a plaza which has once earned the title of the smallest plaza in the Guinness Book of World Records! There is a Trappist Monastery in the island too but, as usually, visiting religious places is not my cup of tea. Jordan, the cute capital, has a well informed Mango centre where you can learn more about mango plantation, preservation, harvest etc. During the Guimaras mango Festival they receive way more visitors than usual – plan accordingly!- as it is located very close to the main area of the festival , the Capitol Grounds. And now the most important part: I beg you to visit the Pit Stop restaurant for their famous Mango–Cashew nuts Pizza; you have to taste it even once in your lifetime! I could eat it every day (oh gosh) and no, it is not like the pineapple pizza! What do you need to know about mangoes? 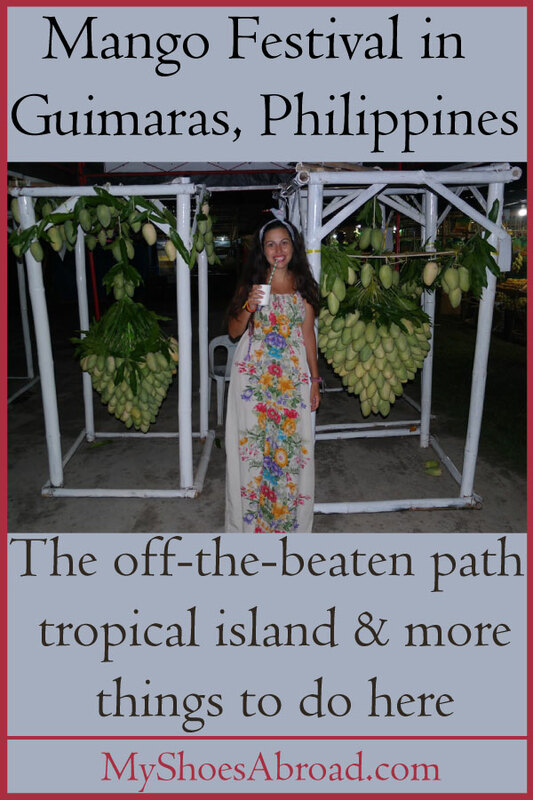 After all these wonderful days in this hidden gem, I almost forgot the Manggahan ( Mango ) Festival – the primary reason we found out this beloved island!- which takes place once per year usually in May. You cant go wrong here if you are a mango addicted like me! The festival lasts for about 2 weeks and it attracts people mostly from East and SE Asia. It is more a fair-trade (with vendors and stalls) and a local celebration than a “western type” festival but that s why it is so special! Competitions “eat as much as you can”, prizes, dances and games are included in the schedule that is announced few weeks before the official first day! If you have read the entire post so far you wont be surprised if I mention that we were being asked by visitors to take selfies with them in front of the mangos! I felt like I was back in China (and again I ate SO much- succulent mangoes are THE passion)! Guimaras Mango Festival 2019 confirmed dates are 11-22 May. Extra Tip for your festival planning: Visit their cute Facebook page! 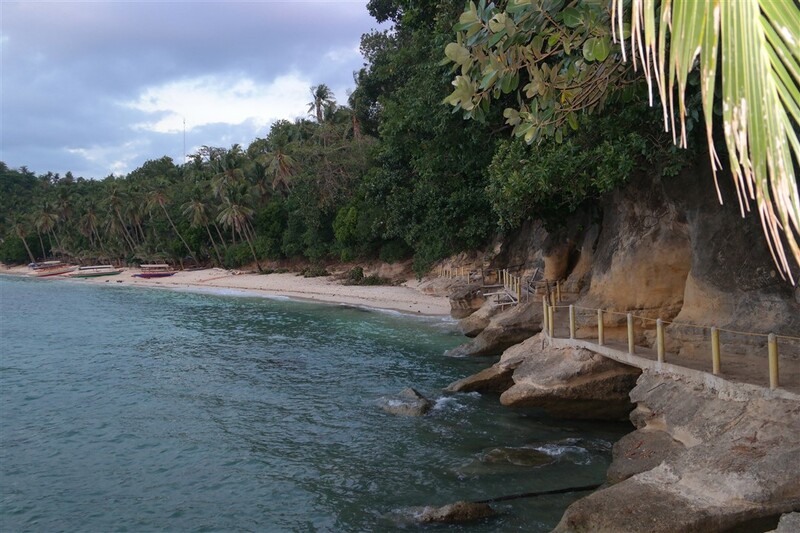 On the other hand, if you are a beach hunter there are sandy and rocky beaches in Guimaras such as: Natago, Alubihob, El retiro, Baras (especially for sunset), Guisi lighthouse attraction that leads to a small beach etc. There are a few daily boat tours you can book that combine many beaches and most of the travellers choose to do island hopping in Ave Maria islet, turtles island and other unspoiled places with crystal clear waters. Keep in mind that there is usually an entrance fee for the beaches in the Philippines which tends to be higher at weekends! Coming from Iloilo, Panay island (the north part of this big island is mainly known for its airports for… Boracay) to Guimaras/ Jordan Wharf is the most popular route and the small ferry connects the two islands consistently all day long. In contrast to Guimaras, Iloilo is a busy vibrant city with a well-connected airport (from here we took the flight to Manila…but this is another story) and you can easily fly to/from other islands such as Cebu, Palawan, Luzon etc! There are long distance ferries too from Iloilo to Cebu, Manila etc if you do not mind the hassle -only if we had more time! I was ready to board on the 25-hour ferry from Iloilo to Manila! Guimaras has indeed few resorts but in general non-Asian tourists are rare here – most of them come cause Tommy’s hub has been showcased on the Lonely Planet, so he was very surprised we stumbled upon him by mistake! Hence, you will visit this out-of-the-way island (such a long haul journey!) because you are seeking for being immersed in the local culture and for experiencing the real life of Filipinas and Filipinos. Not for the pretty beaches, the nightlife or the comfort western-type facilities (unless you opt for a resort) but for the vibes, the (unbelievable!) hospitable people, the untouched nature and the uniqueness. Now it’s time for me to ask… What do you think? Would you make the effort travel to this off the beaten path island? Thank you for this wonderful post about Guimaras Island in the Philippines. I would love to attend the Mango Festival and explore this region. Finally I came to know about some place other than India that seems to be as crazy about mangoes 🙂 I would love to attend the mango festival here. And I am sure there will be many new varieties of mangoes here. It is great that you found such a lovely host during the busy festival. And thanks for the tips for reaching Guimaras from Negros Island. It will surely help the travellers. As for the rest, lets enjoy some delicious mangoes! Loved reading this post. The fact that you had such an immersive travel experience in Guimaras and were able to interact so closely with the locals is so nice. The beaches are of course gorgeous and hope they remain that way. So nice to see the locals mingling well with you. This is what is real travel and not what many others do in the name of travel. What a wonderful time you had in Guimaras! I missed it when I was in the Philippines, and what a shame. I love mangoes so would have loved that festival, and the people there are so sweet and super kind..! Oh my gosh they are my favourite fruit can’t believe there is a festival for them! One for the bucket list ? Superb!! This looks like such a wonderful trip! I would love to visit this area of the world and the Mango festival looked like fun! Philippines is a dream destination of mine, even more so now when I realise there’s a mango festival! Oh woman, this looks amazing! I had no idea there was a mango festival in the Philipines. Yum! Error: Error validating access token: Session has expired on Tuesday, 02-Apr-19 16:48:27 PDT. The current time is Thursday, 25-Apr-19 11:51:04 PDT.